For some, having a healthy breakfast in the morning is a daunting task. A lot of us are time constrained most of the time, so the ideal thing (we think) is to skip a meal and go straight to the lunch. Obviously, this does save some time but has damaging effects on your health in the long run. For such people the ideal breakfast is Muesli /oats. Muesli/oats the healthiest breakfast cereal because it contains all the need of a good diet such as fruits, fibre, protein and calcium therefore it gives you the full benefit of a breakfast, eating muesli/oats in your breakfast equals in eating 2 fruits and all the needed protein and fibre for the rest of the day. Quick and easy great for breakfast, Sunday brunch or a snack – healthy and low sugar bar. In a saucepan bring mixed berries, sugar and to boil on a medium high heat stirring occasionally. Reduce heat and let the berry mixture simmer until it has softened and thickened up. In a small bowl, whisk corn starch and water together creating slurry. Add to the berry mixture stirring constantly until thickened. Refrigerate until cooled, about an hour or up to a day before using. Grease and line the 8×8 or 9×9 square pan. Pat ½ of the oatmeal mixture on the bottom of baking tray pan pressing down to even out mixture. Pour the mixed berry jam/mixture over the base spreading evenly. Spread the remaining oatmeal mixture over berry mixture evenly. Bake it for about-40-45minutes / until light golden. Cool in the pan for 10-15minutes before removing to wire rack, cool completely before cutting. Just as healthy option I have tried to avoid sugar in the making but you can add as per your taste. 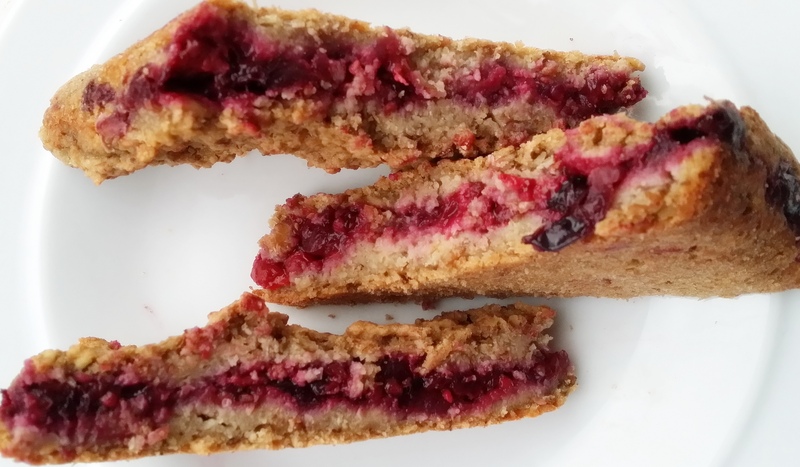 Posted on June 17, 2014, in Breakfast, Breakfast, Indian, International and tagged Berries bake recipe, Chitras healthy kitchen, Currents, drchdietfood, Healthy breakfast bars, Muesli, Muesli breakfast bars, oats. Bookmark the permalink. 5 Comments. very neat idea for healthy bars!